An annual scholarship was created in honor of Brenda Burkholder and David Worth, founders of the Lititz Storytelling Festival, when the Warwick Education Foundation became the official presenter in 2017. 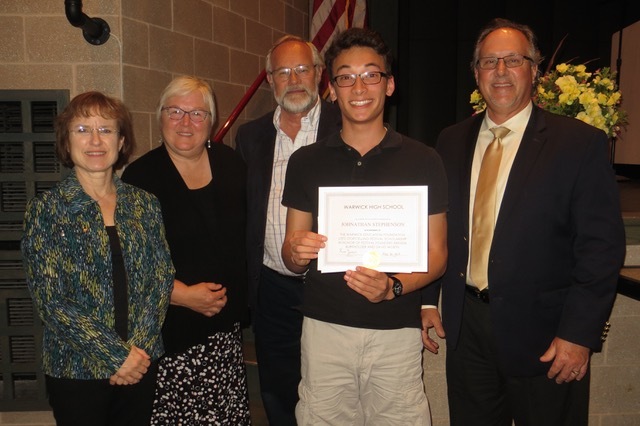 Johnathan Stephenson, Class of 2018, is the first recipient of the Warwick Education Foundation Lititz Storytelling Festival Scholarship. The award is presented to a graduating senior who demonstrates excellence in the written word, spoken word, communications, or performance. A committee of teachers selects the scholarship recipient. Johnathan is a deserving recipient having been highly involved with musical performance including the Production Company, Show Choir and musicals while at Warwick High School. Now in its seventh year, the Lititz Storytelling Festival has grown to become a premier showcase for the art of storytelling both regionally and nationally. Over the course of its first five years, founders Brenda Burkholder and David Worth developed the Lititz Storytelling Festival into a must-attend event. This year, the Lititz Storytelling Festival takes place September 28 and 29 in downtown Lititz and Warwick High School. It will feature an exciting line-up of nationally known storytellers performing storytelling concerts and leading workshops. Tickets and information are available at www.LititzSF.org. Additional information about the Warwick Education Foundation is available at www.WarwickEF.org.